Like most of you, I have a love/hate relationship with bees. I hate their stings, and thank goodness, no one in my family is allergic to them, but I love their role in nature, acting as the major pollinator. 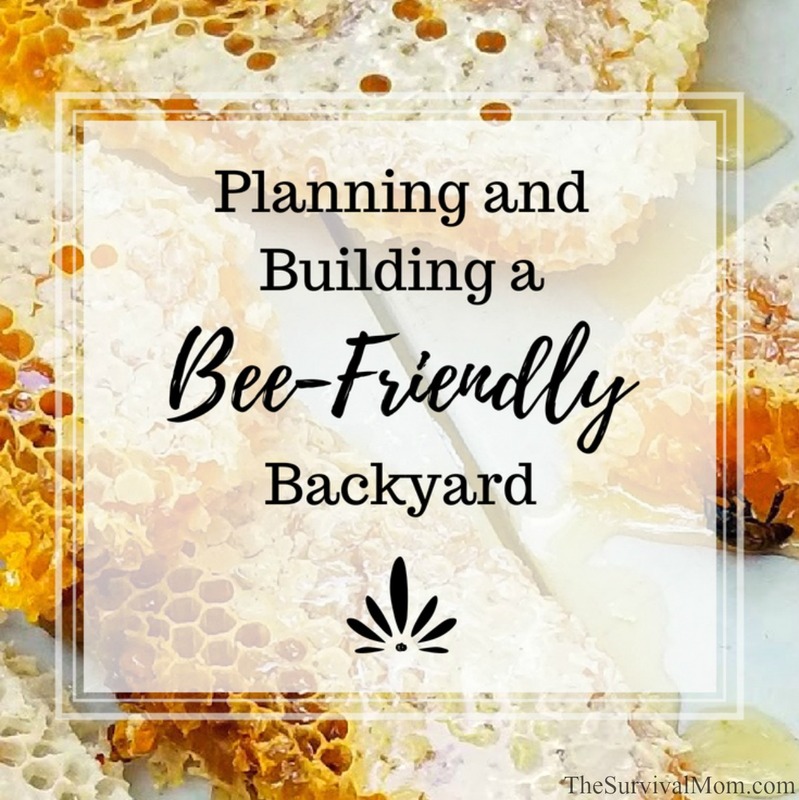 Without them, many different species of plants and animals wouldn’t survive and one way to support them is to create a bee-friendly backyard. Last year we decided to develop a close, personal relationship with bees by adding beehives to our busy backyard. Already we have an owl habitat and both herbs and vegetables growing alongside pines, oaks, and crepe myrtle trees. It’s an odd assortment, to be sure, but we figured that bees would fit right in. With our vegetable plants, in particular, we want to make sure that plenty of pollination occurs since we’ve hand-pollinated our tomatoes this year. It’s never too late to begin adding plants that attract bees. For our own backyard, we immediately realized the need to add flowers. We have plenty of trees, grasses, and shrubs but very few flowers. When I visited a local nursery, looking for pollinating plants, I zeroed in on plants that will do well in our growing zone, 9A. There are so many different and beautiful plants that it was hard to choose just a few. 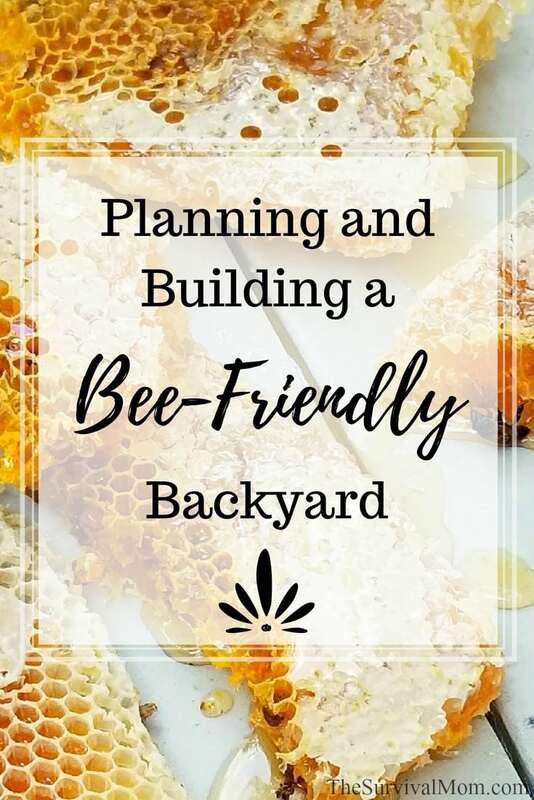 The first rule to develop a bee-friendly backyard is to plant varieties of flowering plants that will thrive in your growing zone. However, in every backyard, front yard, garden, or homestead there are also microclimates, and it’s important to keep those in mind. Microclimates are very small areas that have a different climate from the surrounding areas. When we used to live in Phoenix, I was occasionally amazed to learn that one friend or another was able to grow something that I had thought would never grow in that hot, arid zone. One friend had an enormous bed of calla lilies on the side of her house where they had plenty of shade and the soil held its moisture. Your property also has microclimates and you may, too, be surprised by what you can grow once you figure those out. Just look for areas that have more/less shade, slope, exposure, and wind. One clue to look for is any native vegetation that might be growing where it’s not “supposed” to. Are those areas drier? Wetter? Shady? Those answers can help you know what other plants to try, outside those specified for your zone. The daylilies and the purple Lily of the Nile will do well planted alongside our driveway where there is some shade for the hottest part of the summer and the soil is very rich. I could also have planted them in pots, which is an option for anyone without a yard. Just as you and I have favorite colors, it seems that bees do, too. They cannot see colors in the red end of the color spectrum, so good color choices are yellow, white, purple, orange, pink, and blue. Both of the flowering plants I bought from fill the bill — bright yellow daylilies and a gorgeous, deep purple Lily of the Nile. There are so many gorgeous blooms and colors to choose from and doing a bit of research online helps before you venture out to the nearest nursery. It’s best to plant flowers that grow in clumps, rather than single blossoms on long stems and then to plant them close together. Bees are more attracted to clumps of blossoms and having them close together makes it easier for them to do their pollinating job. There are many other colorful plants, but as you can see, both flowering herbs and food-producing plants make bees quite happy and it’s a win-win if you’re trying to grow your own food! I’m adding different varieties of mint to my garden but will grow them in pots, since they can be very invasive. Your backyard or garden can provide pollination opportunities for bees year-round since bees need pollen and nectar throughout the year. As you begin to narrow down the types of plants that do best in your growing zone, select ones with bee-attracting colors, also check to see when they will flower. Ideally, you’ll want to have plants that flower in the spring and summer, along with those who produce blossoms in the fall and winter. My daylilies and the Lile of the Nile are both perennials and will be ready to produce blossoms again next year. If you live in zone Frozen-to-Death-from-October-through-April, this may not be possible! Along with helpful insects like bees, butterflies, and ladybugs, there are also mosquitoes and other insects that we definitely do not like! However, the over-use of insecticides will also poison bees. Before reaching for an insecticide, do some research and try a natural remedy first. Our plan this summer is to plant multiple pots of lemongrass, citronella, and lemon balm around our back patio to ward off mosquitoes. When my husband and I took a beekeeping class last year, we were surprised to learn just how much water bees consume. In fact, during long, dry seasons, beekeepers have to make sure there is plenty of water in the form of a pond, fountain, pool, bird bath, or other water feature. Even bowls or jars of water are better than nothing for helping keep bees hydrated. However, it’s vital that this water moves and doesn’t stay still. Still water attracts mosquitoes and that’s the last thing you need when creating an inviting garden area. Our local birdwatching store sells a battery-powered Water Wiggler that creates continues ripples. This not only attracts birds since they can more easily see moving water as they fly overhead, but it also prevents mosquitoes from landing and laying their eggs. I highly recommend using a Water Wiggler in your bird baths or any outdoor water feature that doesn’t have continual movement. It’s possible that your home or backyard may end up with too many bees in the form of an unwanted swarm. Now, just because they’re unwanted by you doesn’t mean that a local beekeeper might welcome them! The National Honeybee Swarm Removal project is run by volunteers who will remove swarms for free in an effort to help both the bees and the home or property owner. Give them a call before resorting to deadly methods. There really is a significant problem with bee colonies dying around the country. We rely on them for so many reasons, and it’s relatively simple to make a few changes to our backyards and gardens to provide a bee-friendly space for them to thrive. Add colorful plants that attract bees. Plant a variety so you’ll have blossoms year-round. Avoid the over-use of insecticides and use organic, natural remedies instead. Provide water for them, especially during droughts or dry seasons of the year and learn more about becoming a beekeeper. My landlord has three bee hives, all Africanized bees, as they seem less effected by the bee die-off than standard honey bees. Two of the hives are in an area not far from my house, so I get visits from the bees far more often than I am comfortable with. I AM allergic to bees. I got stung once last year and it took me over two weeks to get over that sting. I worry about them swarming, think I could very well die if stung more than once or twice, at the max. And I worry about my two tiniest dogs, both around 3-4 pounds, if the bees swarmed them, would I either lose my dogs or die trying to save them? I do have a nice garden and put out flowers to attract the bees as the fruit trees and the veggies need their pollination. I made a little raised garden with some wildflowers it says will attract butterflies and hummingbirds, so you know it will also attract the bees. I have also noticed often the bees with gather at the base of pots and planters after I water, to drink the run off water. When the bees start buzzing my face, I make sure and cover my neck, as they seem to like to sting from behind you, and I cover the backs of my arms as well as I can. The landlords told me not to ever spray any of them, that that will, above anything, anger them and cause a swarm to attack. I just tell the bees, to keep going, that I will leave them alone if they leave me and my dogs alone. So far, except for the one sting it has worked. I was scared at first, since I had had a really bad reaction to a sting as a young child, that I could possibly be allergic enough still that I could die from one sting, and although it was bad I did not have breathing problems, so I am not as worried as I had been when I found out the hives were that close to my house. This last fall I did have to take the hummingbird feeders down until recently as the bees would swarm the hummingbird feeders due to lack of pollinating plants. Seeing that many bees at once that close to me and my dogs made me VERY nervous. Once I got the feeders down, the bees pretty well left us alone until recently when we started have blossoms on the various plants. She and her husband got one of the hives from a neighbor who was had found them on their property and was going to call an exterminator. They went over with a wet/dry vac, sucked them up, brought them home, and I guess sucked them out (?) into a hive they had gotten ready for them. One last remark, this bee die-off is not just a national problem, it is international and if not stopped or corrected could eventually bring on famine such as the world has likely never seen. LOVE this post! Very informative in a simple manner and interesting! I love the honeybees and definitely trying to start up my own apairy- being a college student makes it tough! But certainly a high priority goal for my long term future. Looking forest to reading more of your posts!